On December 1, 2017 Met-Ed enacted a price hike on their residential electricity customers who are on the utilities default supply service price. The former default price of $0.05995 went up to $0.06816 representing a 13.7% increase that will effect an estimated 335,769 customers who receive their power supply from Met-Ed. Fortunately for these customers there is a silver lining; current competitive Met-Ed prices are well below the new default price presenting a chance for consumers to lower and manage their electric bills. Even though good savings are available for Met-Ed residential customers only 33% of customers in the region have selected a competitive electricity supplier in order to better manage their energy expenses. The remaining 67% remain on the utility default price. Some energy experts have hypothesized that the reason for the slow switch rate is the confusion among customers concerning what information to provide on the competitive electricity supplier enrollment form. In order to switch electricity suppliers Met-Ed requires that the customer provide their “Customer Number”, a 20 digit number found in the middle of a lot of small print on the Met-Ed bill. Numerous electricity suppliers have reported a high percentage of enrollments being rejected due to customers inputing their “Account Number” which is more easily found at the top of the electric bill. 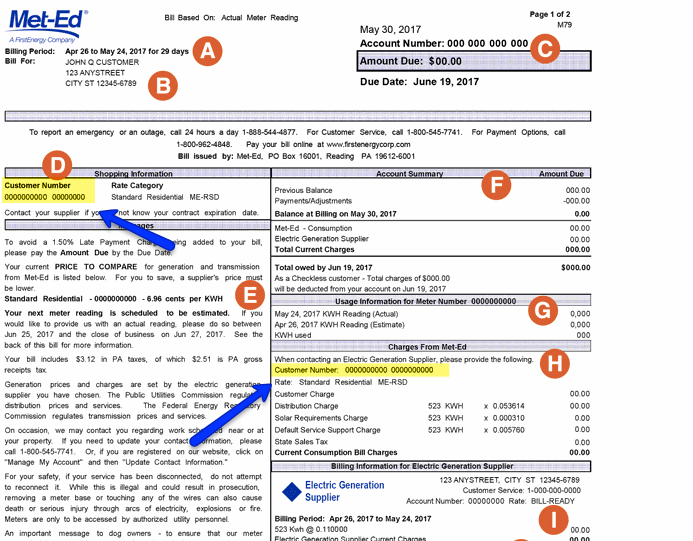 Below is a sample Met-Ed electric bill with the “Customer Number” highlighted in yellow. When shopping for low Met-Ed electricity prices be sure to use the correct utility number.